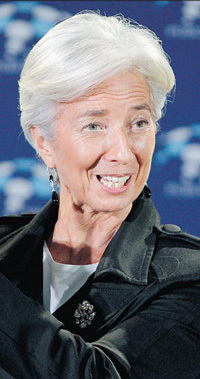 IMF Managing Director Christine Lagarde is a French lawyer. Gold is down in the dumps right now. This is partly due to the general Christmas wind-down in levels of general trading, as well as concerns about EFT which may or may not hold Gold. Nothing goes up in a straight line – hence the current correction in the yellow metal. Meanwhile, Europe and the US are on the path to inflation. The printing presses of the world’s biggest economies are churning away ‘QE’ing’. Whether this will result in hyperinflation or a more manageable 5-10% rate is yet to be seen. Gold will appreciate in 2012, however. New highs will be reached. Gold will get over $2000 with a chance of run at $2500. The euro is saved – it’s also doomed to devaluation. Without Germany on the inflation bandwagon the euro was strong. This was because weak members were set to fall out of the zone, leaving behind Germany and other stronger economies. Now the latest ‘Euro-fix’ is in, Europe will print and print and print. This will take the form of lending money to the IMF who will lend it back; ‘buddy deals’ with the US - anything to not appear to be merely printing euro notes. In any event, money supply will be expanded to bail out the Eurozone and inflate away the vast, accumulated debts of the governmental wastrels. Germany, France and Italy crashed in 2011. The US and UK didn’t. The FTSE and Dow teetered and tottered but didn’t fold. In 2012 they will. Maybe it will be in April/May when giant developing world countries bloated with western currency put on their hedges and readjust their vast stashes of cash, or maybe it will just kick off randomly. To avoid a crash, the whole sorry credit crunch saga will need to be over. That seems like a dream we are likely to wake up from in 2012 with a nasty jolt. There are 3-5 years of economic lumps and bumps to get through and a US/ UK stock market crash is likely to be one of those bumps. Inflation will zoom in Europe, hitting levels now seen in the UK. The US is following. Inflation is standard treatment for state debt. It’s the only way out of the fiscal dead end Europe and the US are at. Even though it’s enshrined in the mandates of central banks, 5-10% inflation is the only solution to clearing up the mess left behind by binge-spending governments. Expect plenty of denials and lame explanations and price rises on the shop shelves. The age of price stability is rapidly coming to an end. Don’t confuse your brains with a bull market, the old market saying goes. Meaning: ‘Even an idiot will do well in a bull market, so if you have made a packet in a big rally don’t think it was because you were smart’. Emerging markets have been the recipient of huge US largesse. Like an attached sea cucumber, America has expelled its economic stomach to buy off trouble. The EU has not been any less saintly, maintaining huge trade deficits to BRIC countries. That river of money is about to be choked off. As the first tightening starts in the developed world, so the BRICs are already folding. The emerging market bubble will begin to collapse in 2012. Nonsensical valuations in emerging markets will vanish, just as they did in the Dotcom crash. Overleveraged businesses will fold. Developed world austerity will be a hammer blow for the developing markets: ‘Game Over’. Banks are getting direct access to the printing presses of the US and Europe. This should keep most of them in business. However, some will fail stress tests and be nationalised in the same way banks were swallowed up in the UK in 2008. It’s a poisoned chalice for the politicians but they love to meddle. Having banks to tinker with will be just the temptation they need to sweep up a large chunk of Europe’s financial infrastructure. Sarkozy and Merkel should, of course, carry the can for Europe’s problems. Where were they when Europe was getting high on spending? Like any US CEO hauled up in court, they were elsewhere with no idea of the terrible crimes going on below. Out with them?! No chance - the respective electorates will be impressed by their leaders’ crisis management skills - even though said leaders helped create the crisis. Obama, on the other hand seems set to be a tragic Jimmy Carter, a one- term President ground down with nothing to boost his popularity. Yet he, too, will be re-elected. The Republicans simply do not have a candidate to beat him. 2012 will see the US economy magically blossom. Deep in the underbelly of America, things have been picking up. 2012 will see this comeback break the surface and give Obama the tail wind he needs to have his final four years.